First, they needed the right setting — a stately home for the Duke of Sandringham — and what could be better than the home of an actual duke? 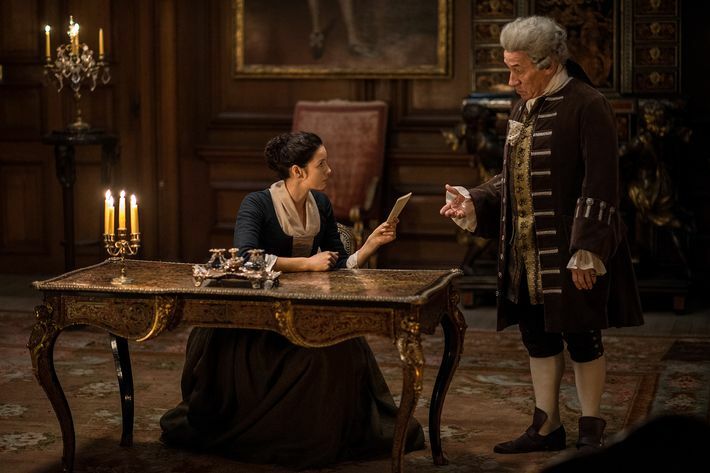 Production designer Jon Gary Steele found images of Drumlanrig Castle in a book, and shared it with locations manager Hugh Gourlay, who then sought out the Duke of Buccleuch, owner of the estate. A private man, he didn’t care much for the idea of a TV crew coming by his castle (or having Outlander fans stopping by in droves once the show had aired) but his house manager — actually an Outlander fan herself — convinced him otherwise. And so Outlander not only got permission to use the castle itself, but the estate grounds (which subbed for scenes in several episodes) and the authentic and well-maintained 18th-century furniture, paintings, and tapestries inside the building. The Duke of Buccleuch’s estate. Photo: Steffan Hill/© 2016 Sony Pictures Television Inc. All rights reserved. From there, the actors rehearsed the scene the night before filming in the next location, the kitchen of the Callendar House, where they had decided Claire would break free of Danton’s knife at her throat, slam his arm on the table, and take the knife, while Mary would stab Danton. But “this left Jamie and Murtagh at rather loose ends, and the Duke floating around at the wrong end of the room,” Gabaldon said. The author offered another suggestion to help with the fight choreography — the men could act as protectors. “Any male primate, from gorillas on down, will grab the nearest female, put her behind him, and charge the threat,” she said. Actor Sam Heughan came to the same conclusion, even though he hadn’t heard her comment to the director. At the next run-through, he stopped what he was doing and said, “No, no. 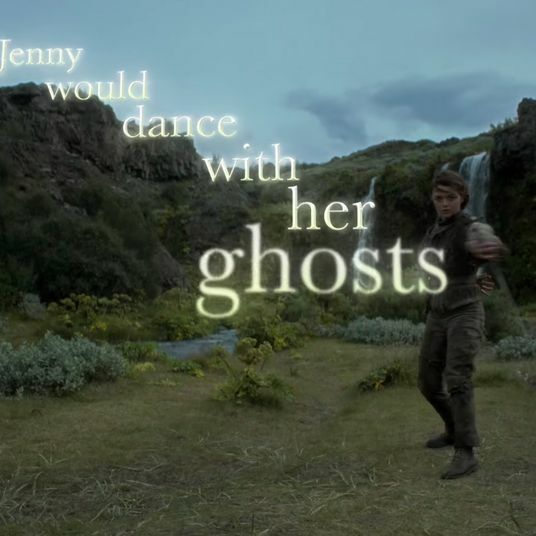 I wouldn’t do that [as Jamie]. I’d shove Claire behind me and go for Danton.” With the writer and actor in agreement, the director assented. 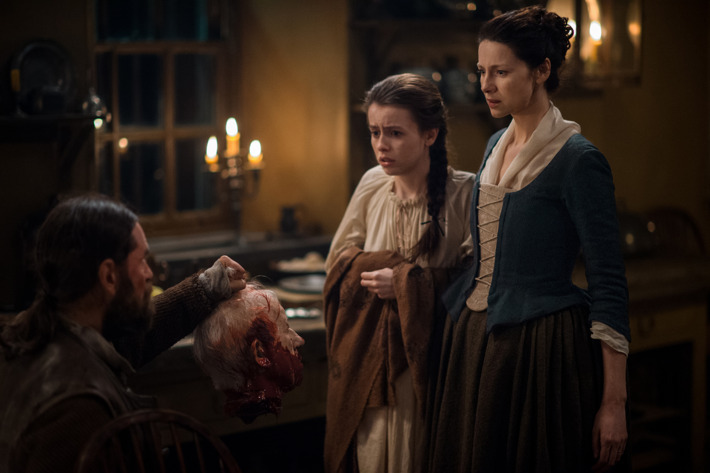 In the final cut, Danton holds a knife to Claire’s throat, Jamie’s at bay, Murtagh enters from the back door and breaks Danton’s concentration, Claire elbows him in the ribs and breaks free, the knife falls to the floor, Jamie lunges for Danton, throws him on the floor and slugs him. “Everyone’s fighting, everyone’s attention is elsewhere, and then in the background, I go and take the knife,” said actress Rosie Day, who plays Mary. “I take my revenge on the man who raped me.” The Duke backs away, straight into Murtagh, who’s picked up an ax. “And … bloosh,” said Gabaldon. Off with his head.